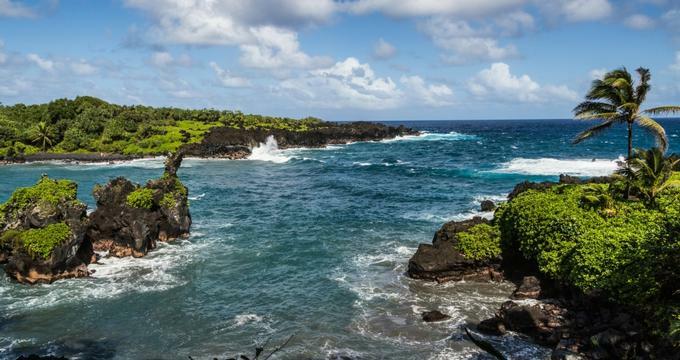 From massive Haleakala National Park with its gorgeous nature and ancient volcanoes to the cascading waterfalls of Ohe’o Gulch, Maui is truly a beautiful place. There are 30 miles of beaches along the shoreline, featuring an excellent selection of hotels, resorts and inns. This beautiful resort is situated on 22 acres of gorgeously landscaped property designed to make visitors feel right at home in the tropical garden setting. Accommodations consist of all suites and villas, each of which is incredibly spacious with luxurious marble bathrooms, full entertainment systems, private lanais, and separate bedrooms. There are three swimming pools at the resort, one of which is adults only, and also a 140-foot waterslide. A kids’ club, fitness center, and spa round out the amenities at the Fairmont Kea Lani, as does of course the convenient beachfront location. The Westin Maui Resort and Spa at Ka’anapali is a great destination for both couples looking for a romantic getaway as well as families looking for fun in the sun. There are four beautifully landscaped outdoor swimming pools at the Westin Maui Resort, including one that is adults only and one that features an aquatic playground for the kids. Rooms boast private balconies with lovely ocean views and can sleep up to four people. The Westin Maui Resort has four delicious restaurant options, plus a lavish and tasty luau feast, which is offered 3 to 4 times a week and features a night of live entertainment. Wailea Beach Resort is an upscale resort that features four diverse restaurants, two cafes, a spa, golf courses, and so much more. 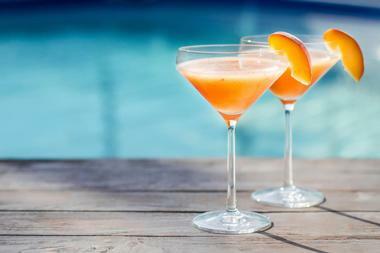 Guests can enjoy an afternoon splashing in the outdoor pool, which has two slippery and fun waterslides, followed by a refreshing cocktail from the poolside bar. In the evenings, guests can even arrange for a private candlelit dinner on the beach, personally served by a chef to include Hawaiian traditional food or personal favorite dishes. Rooms feature high-speed Wi-Fi, private balconies or lanais, desks, and flat-screen TVs. Premium suites include separate living areas, gorgeous private verandas, and dining areas. 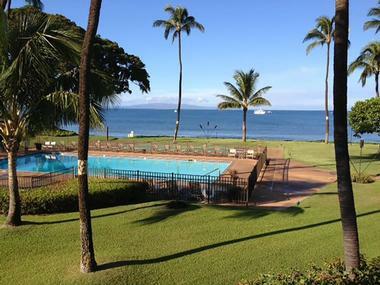 At Ka’anapali Beach Hotel, guests can expect an incredibly Hawaiian experience. With lovely, comfortable rooms that give off a beachy vibe with their wicker furniture and island-themed accents, Ka’anapali Beach Hotel’s rooms also have lanais and free Wi-Fi, and some of them have stunning ocean views. With a large swimming pool shaped like a whale and the beach at your fingertips, there’s no shortage of things to do at Ka’anapali, but should boredom arise, the hotel offers plenty of complimentary activities such as ukulele and hula lessons, lei making, lauhala weaving, bracelet making, and language classes for those interested in the Hawaiian culture and language. On Monday nights, guests are also invited to take part in the weekly luau feast. 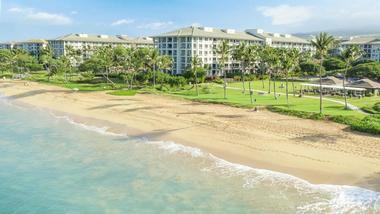 The rooms and suites at Aston Kaanapali Shores offer a homey experience for every guest. With options ranging from a standard queen room to a two-bedroom, two-bathroom oceanfront suite, complete with a washer, dryer, and designer kitchen, Aston Kaanapali does everything it can to make sure guests feel at home. 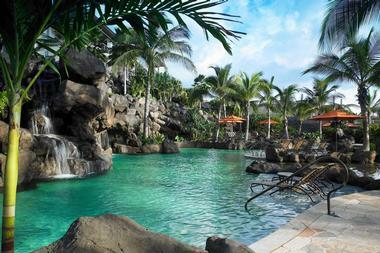 The resort’s grounds include two massive pools, a hot tub, sauna, lounge chairs, and outdoor seating and dining areas. Guests can also take advantage of the hotel’s cultural activities, like free weekly ukulele lessons, hula classes, lei making classes, and even a “cocktails and canvas” night. There’s also a kids’ camp so the whole family will have no shortage of things to do. Aston Maui Kaanapali Villas will transport guests to a Polynesian village resort, complete with meandering stone paths and thatched umbrellas by the pool. This relaxing beachfront resort offers a delicious daily breakfast, an oversized swimming pool, and delicious cuisine at Castaway Cafe. There is also a children’s pool for young guests of the hotel as well as a fitness center, shuffleboard court, and outdoor barbecue grills. All studios and suites at Aston Maui Kaanapali Villas provide full kitchens, and all rooms have miniature refrigerators. Accommodations are all spacious, sleek, and airy, with balconies, garden space, and comfortable furnishings. 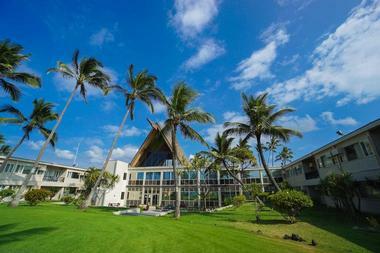 The Paia Inn is a small, trendy boutique hotel with cozy rooms and suites available for rent. 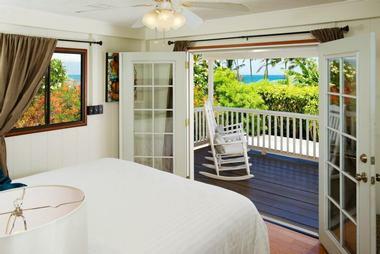 All rooms have bamboo floors, patios, and private beach access. Large groups or families visiting Maui for weddings or other events can even rent a three-bedroom beach house with a full kitchen and a private hot tub. The inn’s spa offers in-room massages and spa treatments, and the Paia Inn Cafe offers guests gourmet meal options for brunch as well as local Hawaiian coffees and freshly pressed juices. The staff at the Paia Inn is trained and ready to help each guest plan the activities for the day, from surfing lessons at the beach to a helicopter tour of the Hawaiian Islands. At Honua Kai Resort and Spa, guests will find all of the amenities and luxuries they’d expect from a high-end vacation resort as well as the spacious accommodations and freedoms of a condominium resort. With options ranging from studios to one, two, and three-bedroom suites, accommodations at Honua Kai Resort and Spa feature full kitchens, spacious lanais, and even washing machines and dryers in each suite. Guests will also love the Ho’ola Spa, the fitness centers, and the massive swimming pool, designed with boulders and waterfalls to serve as an aquatic playground for the whole family. Ho’olei at Grand Wailea, part of the esteemed Waldorf Astoria group of hotels, carries with it all of the luxury and amenities that one would expect from the brand. 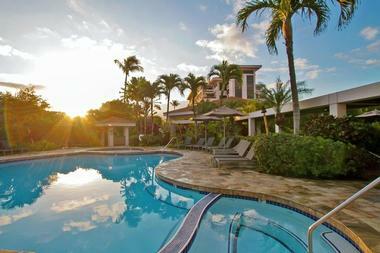 The villas at Ho’olei are perfect for family vacations, weddings, events, bachelorette parties, or other large groups. Each villa has two stories, three bedrooms, a full kitchen, garage, private elevator, and more; the absolute best place for large gatherings. The resort also boasts a large swimming pool, eight restaurants and bars, three golf courses, and plenty of recreational access including kayaks, snorkeling equipment, and scuba lessons. 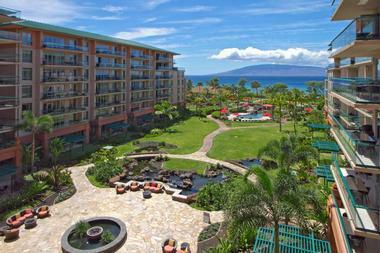 Kaanapali Ocean Inn is a quiet hotel located on the beach that offers affordable accommodations and no resort fees. Rooms are well appointed and comfortable, with private lanais, free Wi-Fi, and small seating areas. The inn is part of the Royal Lahaina Resort, and guests at the Kaanapali Ocean Inn can take advantage of all the resort’s amenities, like the restaurants, spa, shopping, and sports courts. Also available for guests is the entertainment of the nightly torch lighting ceremonies and a seat at the luau feast, which includes food, beverages, and a full night of unforgettable entertainment. 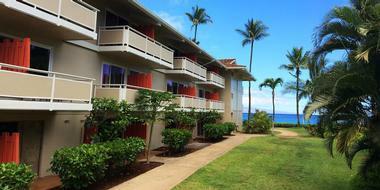 Kihei Beach Resort offers condos with one or two bedrooms for a comfortable, memorable Hawaiian vacation experience. The beautiful location, right on the beach with gorgeous views, means that guests are just steps away from a day in the sunny sand of some of the best beaches in the world and all the action that accompanies it. Each of the suites at Kihei Beach Resort is uniquely furnished and decorated with an island theme and a personality all its own. The suites are great for families or groups traveling together, and many of them can accommodate up to six guests. The beautiful arched colonnades of Lahaina Shores Beach Resort lend an air of classic grandeur to the atmosphere as guests enter the premises, and the plantation-style resort continues this theme by offering classic style and modern comfort, all in one sleek package. The vacation condos offered at this resort allow guests to feel right at home with full kitchens, multiple bedrooms, and private beachfront patios along with all the amenities and services expected of a high-class resort like a 24-hour concierge desk, swimming pool with whirlpool spa, daily maid service, and complimentary coffee service. 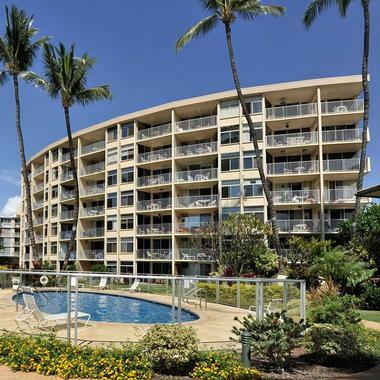 At Maalaea Surf Resort, guests will feel right at home in the one or two-bedroom condos and villas, which come equipped with air-conditioning, full kitchens, private lanais, free Wi-Fi, and cable TV. Outside of the rooms, there are two spacious swimming pools surrounded by swaying palms and relaxing chaise lounge chairs, tennis courts, barbecue grills and, of course, the beach. From the oceanfront property, guests can watch the sun rise and set over the horizon and, at certain times of the year, even go whale watching without ever setting foot on a boat. 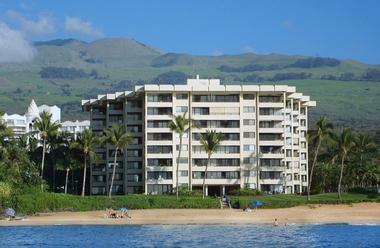 Maui Banyan Vacation Club is located on the sunny sands of Kamaole Beach, at the south end of the island of Maui. Suites are island themed, with full kitchen facilities for in-room meals, private seating areas, and comfortable bedding. Tennis courts, an outdoor barbecue and grilling area, and a spacious property make for a great community vacation vibe, and the large swimming pool, surrounded by comfortable lounge chairs, is perfect for an afternoon spent swimming, reading a book, or sunbathing with a cocktail in hand. Then of course there’s the beach, which is sunny, sandy, and offers plenty of opportunity for watersports and fun. 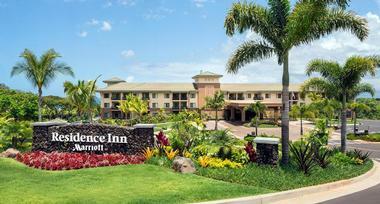 The modern Maui Beach Hotel features spacious, airy guest rooms with tropical furnishings and free Wi-Fi. The hotel prides itself on offering oceanfront rooms without the expected oceanfront prices that many other Hawaiian resorts charge their guests. The hotel is pet friendly (with a small fee), has a free shuttle service to the airport and nearby attractions, and offers a 24-hour front desk to help guests plan their days and activities. A rooftop pool at the hotel features a sundeck, where guests can swim and sunbathe with a lovely view and plenty of access to the sun. The 265 rooms at the Maui Coast Hotel are comfortable and richly decorated; all of them are smoke free, luxurious, and feature Hawaiian artwork by a local artist. The hotel offers complimentary use of laundry services, an activities concierge for planning full and exciting days, shuttle transportation, car rental services, and daily seminars regarding activities on the island of Maui. Guests can enjoy a meal served in their room via room service or at one of the hotel’s restaurants and cafes, including a poolside cafe and bar where hotel guests can enjoy a refreshing cocktail or a bite to eat served right by their chaise lounge chairs. 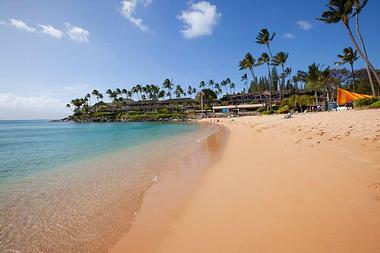 Napili Kai Beach Resort focuses on helping guests to tailor their vacation experience with a personal touch. Their trained and knowledgeable staff can help you plan for a relaxing beach vacation spent at the spa or reading a book on the sand, or an activity-filled, active experience that includes surfing, hiking, sightseeing, and more. 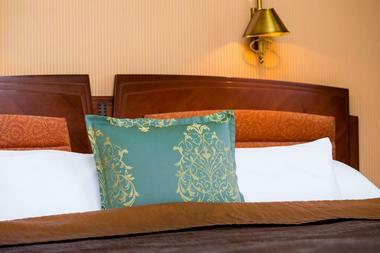 Rooms are relaxed and comfortable, with free Wi-Fi, private lanais, and sleeper sofas for large groups or families. Located on the beach and near a major golf course, Napili Kai is situated conveniently for guest preferences of all kinds, and the resort itself offers weekly activities that range from lauhala weaving, Hawaiian fishing, and Mai Tai parties. 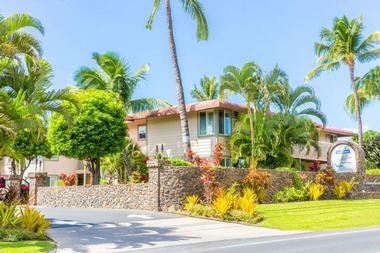 Dolphin’s Point Maui is a gated community on the beach that is home to three beautiful and intimate suites available for rental. The Ginger Suite, which is a studio rental, sleeps two people and is a perfect setting for a honeymoon retreat. In the Hibiscus Suite, a one-bedroom apartment that sleeps four, guests will have access to a peaceful lanai, private sitting area, and full kitchen. In the Plumeria Suite, guests will enjoy a luxury two-bedroom unit that is directly adjacent to the beach and can sleep up to six people. All three of the suites are available for rental, and for large families or groups, the suites at Dolphin’s Point Maui can sleep up to twelve. The Polo Beach Club features vacation condos available for rent. The condos can sleep up to six people, with two bedrooms and two bathrooms, so they’re perfect for families or groups traveling together. Most of the accommodations have ocean views, and all of them have fully equipped kitchens, private porches, and they are fully stocked with everything guests need for a fun holiday. When guests arrive at the Polo Beach Club, they’ll be greeted with fresh flower leis, and as part of the benefit of staying there they will also receive discounts at local grocery stores, spas, and restaurants, which they can use throughout their stay. 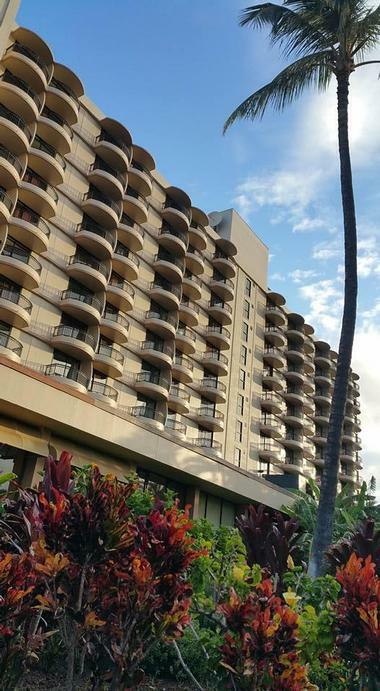 The Residence Inn by Marriott Maui Wailea is an extended stay hotel, which means that it has included every touch to make its accommodations feel like home. Every room and suite at the Residence Inn has a fully equipped kitchen as well as high-speed internet, and many of them have private balconies, from which some stunning views of the Hawaiian sunset can be seen. Every morning, a complimentary breakfast buffet is offered so that guests can start their day right with cereals, fruit, Belgian waffles, coffee, and more before heading off for a day at the beach or sightseeing. Whether visiting Hawaii for a family vacation, destination wedding, honeymoon, or just to get away from it all, Royal Lahaina Resort has got you covered. This beautiful beachfront resort offers rooms, suites, and beach cottages to suit singles, couples, families, or groups, each with comfortable accommodations and plenty of included amenities. In the evenings, guests can join in on an oceanfront luau feast, featuring fire dancers, traditional music, hula dancing and, of course, a heaping array of delicious traditional Hawaiian food. The resort also offers a wide variety of cultural activities, like lei making, ukulele lessons, and live Hawaiian music performances. The Hale Pau Hana treats every one of its guests like ohana – family. From the moment guests walk through its doors, they’ll be told, “Welcome home,” and spend the rest of their trip wishing they never had to leave. Located directly on Kamaole II Beach, Hale Pau Hana translates to “the house of no worries,” and encourages its guests to leave responsibilities, cell phones, and problems behind in favor of a relaxing, fun holiday. With a heated pool, direct beach access, BBQ grills, and daily coffee served on the gorgeous lawn, Hale Pau Hana truly does everything in its power to offer guests the vacation of a lifetime. Renting a villa at the Westin Ka’anapali Ocean Resort Villas means having a studio, one, or two-bedroom unit for the duration of your vacation, which includes a kitchenette, whirlpool tubs, and free Wi-Fi. Villas can sleep up to eight people, so they’re perfect for destination weddings, family vacations, or large groups of friends traveling together. The hotel features a large lagoon swimming pool equipped with a waterslide as well as water basketball hoops and a net for water volleyball, in addition to a kids’ pool with a pirate ship playground at the center. There’s also a picnic area with barbecue grills, a kids’ club, golf courses, and a fitness center. Just because Days Inn Maui Oceanfront Hotel offers budget-friendly accommodations doesn’t mean that guests have to miss out on any of the amenities that make big resorts so fancy. The Days Inn Maui offers its guests comfortable, straightforward rooms, free Wi-Fi, and an onsite restaurant where they can enjoy a tasty meal. There is a fitness center on site and, of course, Keawakapu Beach, one of the most romantic beaches in Maui, is located just steps away from the hotel, so guests will have the opportunity to spend their days on the sand sunbathing or catching waves out on the water.